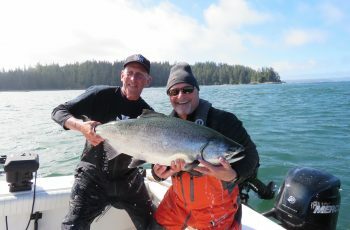 The rain has returned this afternoon, wet but fishable here at Langara. We are all in now, huddled around the fireplace having a beverage, telling stories and sharing some laughs. The rain room is being tested for the first time this year, the only guys left out in the wet are the Dock crew, sorting, filleting, and icing today’s catch. 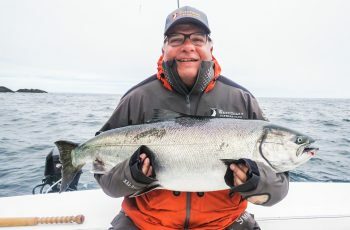 Chinook fishing is slow today, fish are here but not in big numbers. 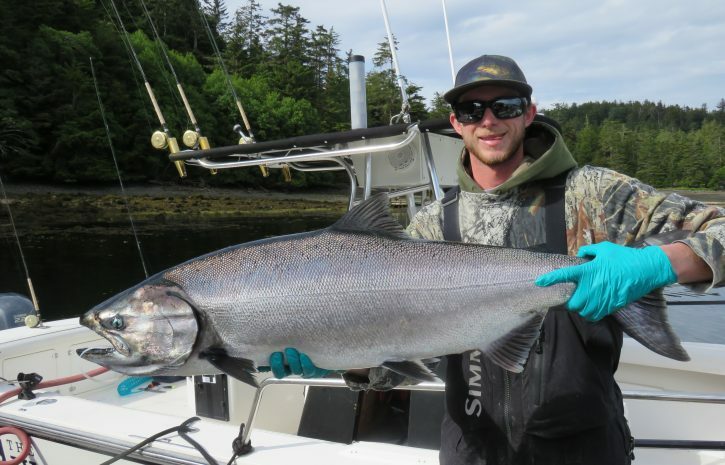 That said Kory and his guests stopped in at the reef tonight and clubbed a 39, on the way in from halibut fishing. The hali went well for them as well, grabbing three guests limits of nice 25 to 40 lb fish. I was out there too, where? Well out off the west side in the low swells and pouring rain, head buried in a gut bucket, threading meat onto primitive hooks, dropping to the bottom some 230 feet deep. We watched Kory grab his fish, then moved to his spot and in short order had a 51 and a 70. So pretty painless, the other boats did okay as well. Rumor has it Conman released a fish over 200 lbs, his eyes were as big as dinner plates. Yes nice to put those back, well done. The new Avet reels are so nice to use for this primitive fishery, smooth drags and wow, super fun to use. 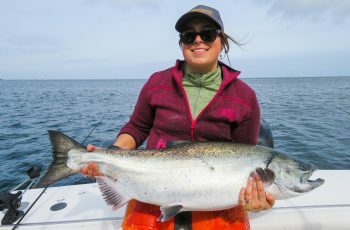 Salmon are in the Andrews area, although mostly jacks, and in the Lacy area, where the Chinook averaged about low twenties. 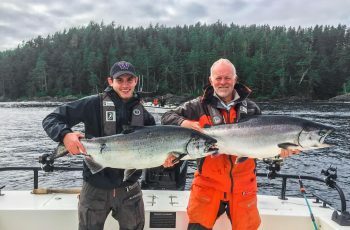 We had a double in the area, and hit four in a one hour period out at Lacy, and the boats around us were busy for a short time period. 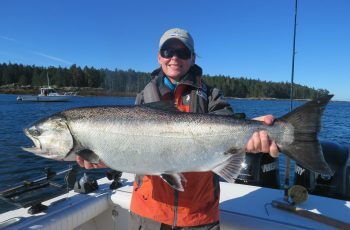 I did not see heaps of big fish at the dock, but I noticed some 18 to 21 lbers in most of the guides totes. The rain will ease overnight and the whales hopefully travel east, so lets hope tomorrow is a good one. Check back for a full report of Saturday’s action.